Welcome to the first day of sneak peeks for Squigglefly's newest images! Here is a sneak peek of "Dinner Bell". When I saw this image I immediately thought of Christmas. 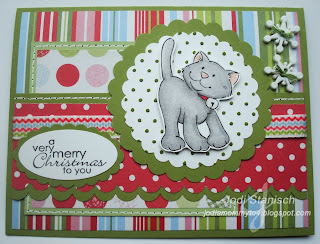 I embossed the white scalloped circle and then colored the raised dots with an Old Olive SU marker. I am still too much of a chicken to sew for real on my cards, so faux stitching it was for the two layered panels. The buttons I found digging through my decorative button stash and they were the "purr-fect" touch to this card. This month we had two new artists join the Squigglefly team ~ Cheryl Alger and Eline Pelinkhoff (whose image I used for my card). Both of these ladies are extremely talented and we know you're going to love their images as much as we do! Our other artists have been working hard to bring you images that will certainly spark your creativity too. The images you will be seeing over the next few days will be available for purchase on Saturday, October 17th. Be sure to check out the Design Team's blogs (you can find the links on the right side of my blog) over the next few days to see lots of fantastic sneak peeks using these wonderful new images! You will need to find the button and then head on over to Holly's blog and leave her a comment telling where you found it. You will have until Saturday to find the button and leave your comment. On that same day, a FIVE random winners will be chosen out of all the correct entries. Each winner will receive two images of their choice! You can pick one of the fabulous new images, or a favorite that you've been meaning to get. So what are you waiting for? Head on over to Squigglefly and begin your search! Jodi this is really so adorable. I love the double scallop, and those little snowflake buttons are just too cute! Great faux stitching on this too! Jodi.... I LOVE this!!!! I am a cat lover so this is one image I will have to get!! What a fun image mixed with that fun paper! I love it all! I'm a big sqigglefly fan and have several of the images....it is a fantastic company! 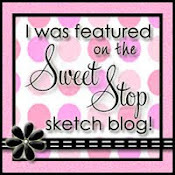 I'm so excited you participated with the Sweet Stop Challenge and I hope you will join us again really soon! We'd love having you back, again and again. Gosh that stitching fooled me...looks so real! This is a precious image and you did such an awesome job with it! FABULOUS choice of DPs! All your detail really makes for an ADORABLE card! This is fantastic , I love the image. Thanks for joining us at Cupcake crafts this week. Thanks for joining us over at Creative Inspirations this week. Adorable card! 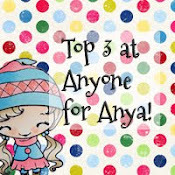 Love the layout and colors - and the image is really cute! Thanks for playing with Cupcake Craft this week. What an adorable image, I love your layout and those papers. What a darling image Jodi,your papers and layout are gorgeous. Fabulous detail with your stitching and snowflakes. Thank you for playing along with us at the Creative Card Crew this week.